A brutal winter has left more travelers across the U.S. and Canada dreaming of summer vacation, according to new numbers from Best Western International that show an uptick in advance summer travel bookings. Best Western is responding by helping travelers plan, share and win a great summer getaway through its new “I Dream of Summer” integrated campaign. I Dream of Summer will engage with consumers across the brand’s digital channels as part of a month-long celebration of summer travel. Each week, travelers are able to find new content from Best Western and its partners including suggestions on great destinations, tips and tricks on ways to save and insight from experts on what makes a truly dream-worthy summer vacation. Travelers can join in the conversation by using the #IDreamOfSummer hashtag on Twitter, Instagram and Pinterest to share their summer travel plans, post pics and pose questions. 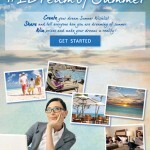 Select travelers who post using #IDreamOfSummer will receive responses from travel experts and great gifts to help turn tips into trips. “We know that our guests are increasingly turning to social media for all parts of their vacation planning process, so we created I Dream of Summer to help generate an authentic conversation about the joys of summer travel on those channels and provide great content that helps travelers make their summer travel decisions,” said Dorothy Dowling, senior vice president of marketing and sales for Best Western International. In addition, now through May 9 travelers can create and share their summer travel “Wishlist” through an image generator on the brand’s Facebook page. Participants will pick the people and places that make a dream summer vacation and the generator will produce a personalized image of their vacation that they can save or share with friends on Facebook. Additionally, they will be entered in a random drawing for the chance to win that dream summer vacation via a sweepstakes that includes free hotel nights, gift cards and Best Western Rewards® loyalty points. The rollout of I Dream of Summer comes as more travelers are actively booking their summer travel plans compared to 2013. Advance booking numbers from the more than 2,200 Best Western hotels in North America show a 10 percent year-over-year jump in summertime stays at U.S. Best Western properties and a 17 percent increase at Best Western hotels in Canada. For travelers who may be dreaming of summer, but also hitting the road this spring, the brand is offering Best Western Rewardsmembers who stay two separate times at any of the brand’s more than 4,000 hotels worldwide a $50 USD Best Western Travel Card® to use for their summer stays. More details can be found here.